I hate to admit it, but I am actually guilty of hunting for rainbow cakes, a new fad that takes the city by storm. 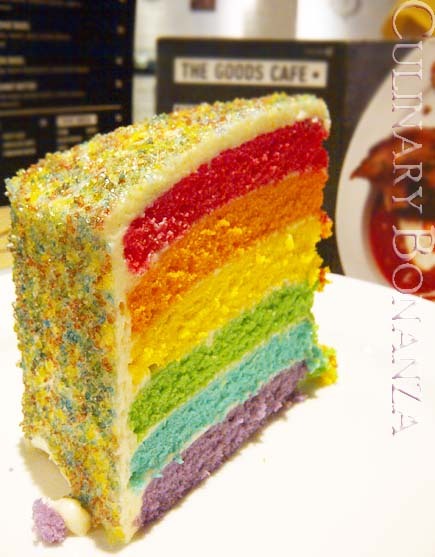 Just in case you live in another planet, rainbow cake is a new breed of cake consisting 6 to 7 layers of garishly-coloured vanilla sponge cake, stacked in the order of the rainbow spectrum from violet to red, topped with either cream cheese frosting or peanut crumbs or coconut shavings. 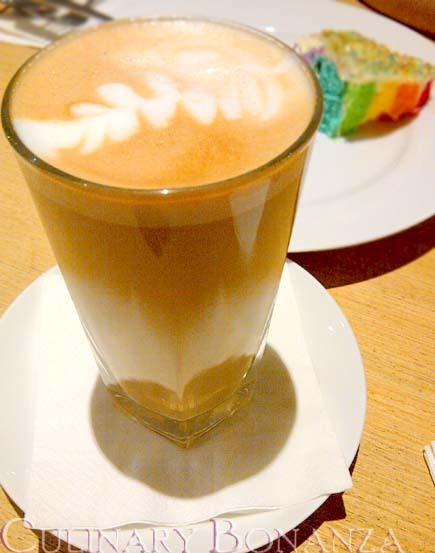 Rainbow cake may have started elsewhere (not in Jakarta), but our city, with the hordes of hungry and (to a certain extent) experimental diners, makes a fertile ground for this vulgar slice of sugar to boom and become a fad. Does this reflect our fad for fat? Whoever knows! Whether you like it or not, rainbow cakes are selling like hotcakes! When I inquired by phone at the few places I know selling these, I was told that before 1pm their rainbow cakes are usually sold out. They only survive an hour or so on the display! 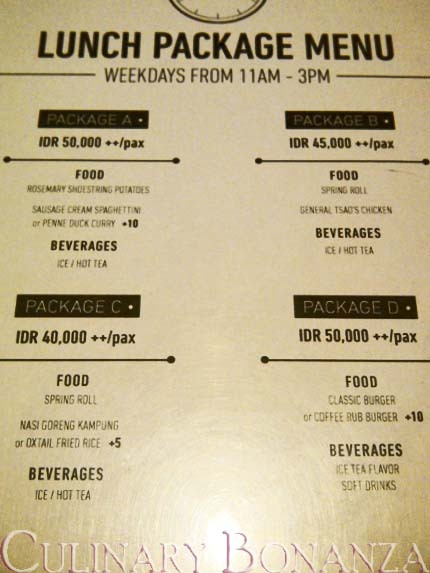 I sat down after ordering the rainbow cake and only then that I noticed the Lunch Package Menu featuring 4 lunch sets at reasonable price (much better than if you purchase a la carte). 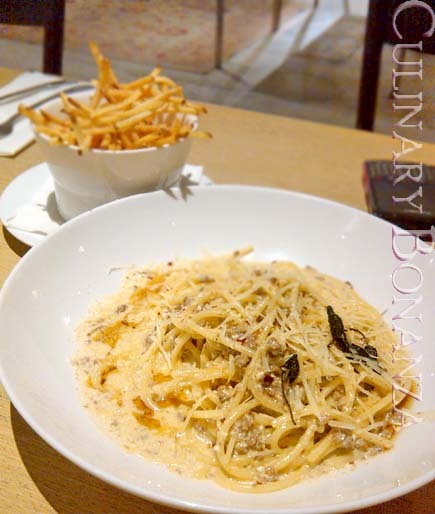 We chose to share Package A that costs only IDR 50,000++ for Rosemary Shoestring Potatoes as appetizer, Sausage Cream Spaghettini for the mains and an iced / hot tea. I was saving the space in my tummy for the rainbow cake! LOL. The lunch was good (maybe I'd say differently if I had paid the normal price. Ha! Watta cheap skate =P). Whereas the rainbow cake was not praise-worthy but not criticizable either. The sponge cake was quite moist and soft, tasted normal despite the heavy colouring, and topped with my favourite topping: cream cheese frosting. All in all, it was a good and tummy-filling lunch.